Most of these are new information that have NEVER been PUBLISHED by anybody, anywhere, and at anytime.UNTIL THIS DAY, NO ONE ELSE ON EARTH SEEMS TO KNOW WHY THESE PROBLEMS OCCUR. 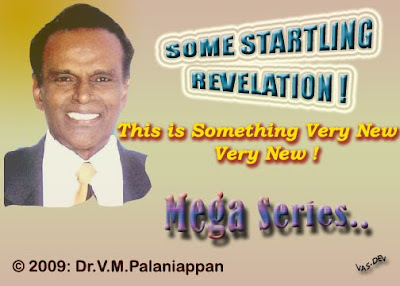 At every juncture, kindly honour my copyright registration.© 1998-2008: Dr.V.M.Palaniappan: Registered at Perpustakaan Negara Malaysia: International SB Nos. 978-967-998-05-8; ++06-6; ++07-4; ++08-2; ++09-0; ++19-4; ++11-6; ++12-3; ++13-0.Chapter 12: Pages 108 – 172. Misinterpretation-26: Tea is good for you: drink it daily. Evaluation: Does not seem to be true! This statement must have come from people who have vested interest in promoting tea. They could be tea growers, manufacturers, dealers or somehow related to tea distribution. Tea contains tannin. Tannin is a known scavenger of iron. All the iron taken into the body through vegetable consumption would get destroyed by tannin. Thus, if a person drinks tea once a day, daily, his blood quality would drop, for want of enough iron for the build up of haemoglobin and thereby the red blood cells. Apart from the ill-effects of tannin, tea destroys appetite and also interferes with digestion. Constipation also will occur because the tea drinking habit. If the constipation becomes acute, then it would turn into chronic constipation, which in turn would increase the blood pressure, sugar content in diabetic patients, and the like. Apart from the above, constipation would also give rise to pimples on face and shoulders.. This in turn would give rise to bad breadth. The hair too can turn prematurely grey. By any measure, I have found that tea is bad for health. Whereas, drinking very diluted hot coffee (if instant coffee, using only one-eighth of a teaspoon for a mug full) appears to be very good for digestion. It is relatively harmless. If anyone wants to drink tea occasionally, it should be alright, but certainly not on a regular basis. Misinterpretation-27: Beer is good for your heart: drink it daily. Research finding shows that beer drinking lessens the chances of heart attack compared to non-drinkers. I am sorry for trying to evalate this with open-mindedness. Again, I don’t mean to hurt the beer-manufacturers, distributors and sellers. That can never be my intention. If I am the brewer of beer, and if I gave you a rich grant to do research, you feel somewhat ‘duty-bound’ to say some nice things about my product, viz., beer in this case. Let us evaluate the possible truth behind the claim the so-called researchers have made. The truth that has been repeatedly emphasised in all my books has relevance to water drinking and urination. More information can be seen in the earlier pages of this book. A person’s heart will remain good if he drinks about two litres of pure water and urinates nearly all of it. If a person does not drink adequate water and thereby under-urinates, his body will accumulate excessive calcium. Such calcium will thicken the blood vessels and give him a blockage in the blood vessels located within the heart, and that would result in a heart attack. They should have, let us say, a thousand people to use as control. These people should be made to drink eight glasses of water daily. Another group of a thousand people must be made to drink eight glasses of beer alone daily. A third group of 1000 people must be guided to take only 2 glasses of water daily. Some 90% of those who took 8 glasses water daily and urinated nearly all of it, did not get any heart attack. About 90% of those who did not drink water or beer had heart attack. Beer drinking is slightly better than not drinking any liquid at all. However, water drinking has been found to be excellent for the prevention of heart attacks. Thus, the researchers who reported that beer drinking is good for the heart were biased, and released a result that was in favour of the beer brewers. One more fact that cannot be overlooked in this connection is, that beer itself contains calcium, and drinking large quantities of it can increase the calcium content within the body, and that can thicken the blood vessels as well. However, if the beer drinker urinates liberally, most of it would get excreted along with it. The latter problem would erupt only if the drinker does not urinate well. Misinterpretation-28: Using magnet should be good for you, and you can be healthy all the time. It will work wonders in you. There are numerous people using this in different parts of the world. They could have found some usefulness by using magnets. Therefore, there could be some truth in it. Whatever, I don’t want to hurt anybody – as said for the previous evaluation. However, since people often ask me this question, it appears I have no choice except to answering it. I have all the time been emphasising that one should cautiously evaluate the truth behind any statement that is put forward in relation to the sale of any product. Magnet is bound to have some effect in humans, as much as in any plant or animal body. This is so because, all living organisms are subjected to many of the forces that may exist on earth’s surface. Earth’s gravitational pull, the effects of Polar Regions, sun’s rays, various cosmic radiations, the magnetic fields, etc. are all natural. Our body grows up in a state of equilibrium in the midst of many such forces. This being the case, if we magnetise intensely any part of the human body, it may upset the Nature’s set up, and that may interfere in the proper functioning of the body parts. The brain, being very sensitive to any deviation from norm, may get adversely affected due to the effects of magnetic forces. It may not be a good idea to experiment with such a sophisticated part of our body, viz., the brain. In the process of evolution, human body being the most sophisticated and highly developed of all organisms, would not have developed a dependency on something that does not exist in nature. An artificial deviation may affect the brain adversely. If a magnet can boost certain activity in the body, then, as a matter of compensation, many other parts of the body may get degraded. Anyway, the iron present in the haemoglobin of the red blood cell is in an ionised state. Therefore, I believe, it may not react to the magnetic fields. Hence, blood circulation may not get enhanced because of the magnetic force. Whatever, it would be better to exercise caution before using something that is unnatural. Misinterpretation-29: Oestrogen hormone therapy will prevent heart attack after menopause. Evaluation: This appears to be the biggest hoax of the 20th and 21st centuries. An observation that is common knowledge in the area of health science is that the menstruating women almost never die of heart attacks. On the other hand, most of the women who have had their menopause tend to die of heart attacks. The major and easily observable difference between the two situations is the secretion or cessation of oestrogen hormone. The oestrogen does not secrete any more in a menopaused woman. Therefore, the researchers have concluded in haste that it is oestrogen that prevents heart attacks in women. With this belief, they have administered oestrogen – the female hormone – to men, to see if it prevents heart attack in them. It does not seem to have worked. On the other hand, several other problems erupted due to such unsuitable inputs. Irrespective of what happened to men, the doctors have started giving oestrogen hormone therapy to menopaused women, expecting them not to have any heart attack. Again it does not seem to work. One other thing the doctors believe while giving the hormone therapy to women is that their bone structure would stay in a healthy state, meaning thereby that the menopaused women would not develop any osteoporosis – the bone weakening. This is so because, significant number of women have been getting the osteoporosis problem after their menopause. In the meantime, some other researchers have found that many of the menopaused women who underwent hormone therapy developed some undesirable side-effects, which included the occurrence of cancer. Thus, the hormone treatment has become a subject of controversy. Nevertheless, most of the urban health-conscious women appear to be undergoing the hormone therapy, only to end up in greater distress. Primarily, it is the accumulation of calcium due essentially to the under-urination habits of men and women that creates the thickening and blockages of the finer blood vessels inside and outside the heart. When such a blockage reaches a hopeless stage, heart attack leading to the death of the person occurs. Any excessive free calcium that is present within the body gets removed through urination. When a person under-urinates, the excesses tend to stay within the body, and they accumulate in the soft cells that make up the soft tissues in various parts of the body. This alone increases the body weight of the person, giving rise to various other major diseases including cancer. Blood vessels constitute one such soft tissue. Calcium accumulates within the cells that make up the blood capillaries, and make them swell up in size, thus giving rise to blockages that could prevent free blood flow that results in heart attack. The above sequence happens in men. However, the story is different in all menstruating, but under-urinating women. The menstrual fluid, at monthly intervals, removes a substantial quantity of the free calcium, which would otherwise accumulate to create blood vessel thickening. As a result, the blood vessels in women do not accumulate to the extent of forming blockages. Therefore, all menstruating women do not get heart attacks. On the other hand, when a woman stops menstruating, the calcium excesses stay back within the body – exactly similar to what happens in the under-urinating men. When this repeats month after month, the body weight of the menopaused woman keeps on increasing, while at the same time, the blood vessel thickening too keeps on increasing. When such increases create a total blockage in the blood vessels, heart attack and its failure occur. Thus, it becomes evident that the hormone oestrogen has absolutely nothing to do with heart failures. Another interesting phenomenon I have traced is that both the men and women who drink abundant water, and also urinate liberally, do not develop any heart blockages, and they do not die of any heart attack either. None of the menopaused women need to die of heart attack as long as they drink plenty of water (about 2 L daily) and urinate nearly all of it. Such women do not become obese as well. IF YOU HAVE ANY DIFFERING OPINION ON ANY OF THE ISSUES, PLEASE DO INFORM ME. I WILL EITHER CORRECT MYSELF, OR WILL TRY TO RE-EVALUATE IT. AS I HAVE BEEN SAYING IT ALL THE TIME, I AM NOT EGOISTIC. THEREFORE, I WILL READILY ACCEPT POSITIVE CRITICISMS, AND WILL CERTAINLY TRY TO IMPROVE MY EXPRESSIONS AND VIEWPOINTS. A FRIEND HAS JUST ASKED ME IF WHAT I HAD SAID ABOUT H1N1 IS REALLY TRUE. I HAVE BEEN GATHERING ALL AVAILABLE REPORTS ON THIS ISSUE COMING FROM ALL OVER THE WORLD. WHAT I HAD WRITTEN ON H1N1 SHOULD BE CONSIDERED STILL CORRECT FOR ALL THOSE PEOPLE WHO ARE SKELETAL-LOOKING AND THIN. HOWEVER, IT MAY NOT BE APPLICABLE TO ALL THOSE WHO ARE OVER-WEIGHT AND OBESE. THIS HAS RELEVANCE TO THE NATURE OF H1N1 ITSELF. THE WORLD HEALTH ORGANISATION (W.H.O) HAS BEEN TELLING THAT H1N1 IS A VIRUS-CAUSED DISEASE. WHEN THE SKELETAL-LOOKING AND THIN PEOPLE GET IT, IT SHOULD BE ‘VIRUS’-CAUSED DISEASE. WHEN THE OVERWEIGHT AND OBESE PEOPLE GET IT, IT CANNOT BE A VIRUS DISEASE. IT SHOULD BE, IN MY OPINION BASED ON MY PERSONAL RESEARCH UNDERSTANDING, A BACTERIAL DISEASE. I WILL QUALIFY THESE STATEMENTS WITH ADEQUATE AND ACCEPTABLE EXPLANATIONS IN DUE COURSE – MAY BE SOME TWO MONTHS LATER, FOR IT REQUIRES ENORMOUS AMOUNT OF TIME TO DO A PROPER WRITE-UP. (AS IT IS, I AM PRE-OCCUPIED WITH MY BOOK-WRITING PROJECT). SHORT NEWS ITEMS MAY DO MORE HARM TO PEOPLE THAN ANYTHING GOOD. FURTHER, MY COUNTRY’S HEALTH MINISTER HAS ASKED US (I MEAN, ALL ALTERNATIVE MEDICAL PRACTITIONERS) NOT TO GIVE DIFFERING PRESS RELEASES ON H1N1, FOR THAT MAY CONFUSE PEOPLE. I WISH TO RESPECT HIS APPEAL. I THANK YOU FOR READING MY ARTICLES. IF THESE HAVE STARTED ‘BORING’ YOU, KINDLY LET ME KNOW. I WILL CHANGE THE THEME TO MAKE IT MORE LIKEABLE AND MORE USEFUL. DISCALAIMER: Western medical researchers and Registered Medical Practitioner have different opinions on all matters presented in my Blog. You are requested to follow the instructions given by Registered Medical Practitioners for the care of your health. Information given here is to provide you with the knowledge for better evaluation and understanding of the health problems.